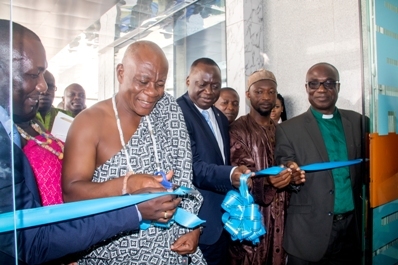 Sahel-Sahara Bank a member of the BSIC Group has officially opened a new branch at Tema Community 11, in the GIAAN Towers, off the hospital road. The new branch is the second branch in Tema and the 17th branch across the country. The BSIC Group, made up of 14 affiliates in Africa, aims at mobilizing financial resources from all over the world and channeling it into productive sectors in the economies of member-states. Additionally, the pan-African nature of the group greatly assists in the development of businesses in the sub-region. The newly opened Branch will be providing customers with Corporate, Commercial and SME banking services. Other services include Retail and Premier banking service, for individuals and high-net worth customers. At the launch of the Tema community11 branch, Managing Director of the bank, Mr. Adama Diop, said setting up a second branch in Tema is strategic, considering the business opportunities. He added that it is the aim of Sahel-Sahara Bank to partner local businesses, to support their growth and profitability. He further indicated that the Branch is to provide convenience, speed and proximity to customers. Deputy Managing Director, Dr. Kojo Aboagye-Debrah said that what makes the bank unique is its presence in both the Anglophone and Francophone Sahel Countries. According to him, the beauty of its operations is that any customer doing business with any of these countries can enjoy service at any BSIC Affiliate. Sahel-Sahara Bank is a truly pan-African financial institution.